The Joseph P. Chaisson Post 41 American Legion is named for the first Milo citizen killed during World War I. On February 24, 1918, while serving with Company F, 103rd, 26 Division, during combat actions in France, Joseph paid the ultimate price. MILO — All veterans are welcome to come to American Legion Post 41. We have a new sign when lit says OPEN meaning we are ready to accept your visit at the post home at 18 West Main Street in Milo (299-4308) and have several members who can assist veterans, widows, next of kin in obtaining discharge records and placing them in contact with the Department of Maine service officers who will assist in seeking veterans benefits and information — they do not need to be American Legion members. American Legion Department Service Officer Carl Curtis can be reached at 623-5726 and serves all veterans at no cost. During the month of November meeting the Post was honored to have the 2018 Dirigo Boys State candidates Jacob Baker and Jeremy Martin of Penquis Valley High School and their supportive parents for a dinner and presentation from the candidates. On Veterans Day in coordination with the Three Rivers Kiwanis veterans dinner, some of the members performed a very solemn POW/MIA ceremony prior to the dinner. We have a potential oratorical contest that can provide money for scholarships coming up in January, and are presently seeking contestants from Penquis Valley High School and high school level homeschool students. Applications can be obtained at Penquis Valley High School or contact the Post. We invite Gulf War veterans to join us even for a few hours a year to help with some of our programs. You do not need to join the American Legion to help out. If you would like to be a part of helping other veterans, their communities, and youth then the American Legion can find a place for you. You can pick what you would like to do and when interested or need assistance, please call me at 943-9198 or 299-4308. Graves Sr. is Past Department of Maine 2014-2015 commander, a member of the Department Public Relations and Education committees, and present adjutant/finance officer of Post 41. Many times we are asked “what does the American Legion do?,” “why should I belong?,” and “what’s in it for me?” These questions hang out there because we do a poor job to telling our story. To answer the first question, the American Legion is the largest veterans service organization in the United States standing on four pillars of service — veterans affairs & rehabilitation, national security, Americanism, and children & youth. 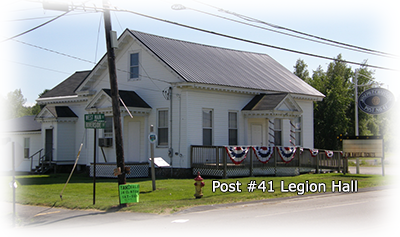 That said, on the local level Post 41 maintains a post home at 18 West Main Street in Milo (943-9198) and has several members who can assist veterans, widows, and next of kin in obtaining discharge records and placing them in contact with the Department of Maine Service Officers who will assist in seeking veterans benefits and information, they do not need to be American Legion members. The American Legion Department Service Officer Carl Curtis can be reached at 623-5726 and serves all veterans at no cost. On a state and national level we have trained legislative members insuring the benefits are protected and funded. It is a constant battle to fight for proper funding. On national security we strive to make sure our active duty veterans have what they need to get the job done. Americanism and children and youth are the primary pillars for which the local post can become involved within in the community. In the spring of the year post members install over 800 American flags on the graves of veterans and retrieve them in the fall, the flags are provided by the town of Milo. Post members who by age should not be on ladders, install flags on the main streets of Milo, maintain them through the summer, and retrieve them in the fall. The flag replacement expense to covered by some patriotic members of the community. The Memorial Day parade and cemetery veterans ceremony is arranged and provided by the post members and greatly supported by elementary and High school bands. On June 14 the United States flags from the cemetery and street flags no longer serviceable are burnt during a respected ceremony with Milo Fire Department and Boy and Girl Scouts assisting. The basketball court grounds are maintained and greatly in use all summer with the cooperation of the town of Milo recreation department. Two juniors were sent to Dirigo Boys State and sponsored by Post 41 and Post 92 of Brownville. On Veteran’s Day in coordination with Three Rivers Kiwanis Veterans Dinner, some of the members perform a very solemn POW/MIA ceremony prior to the dinner. We have other programs such as the oratorical contest that can provide money for scholarships and school award programs, however our aging members make it impossible to do all we would like to do. We invite Gulf War veterans to join us even for a few hours a year to help with some of our programs. You do not need to join the American Legion to help out. If you would like to be a part of helping other veterans, their communities, and youth then the American Legion can find a place for you. You can pick what you would like to do and when. Interested or need assistance please call me at 943-9198. Graves Sr. is past Department of Maine 2014-15 commander, a member of the department public relations and education committees, and present adjutant/finance officer of Post 41. Update: Space at the Craft Fair is only $10.00 per space ! A couple spaces have just become available. Call Jeannette Hughes FMI at 564-8355. As we remember on this solemn weekend, please keep those who continue the fight on our behalf. There will be a parade tomorrow morning at 10AM, leaving from the Legion and ending at the Memorial Wall. Please use caution when driving... Let the parade pass you before you drive onto Park Street. Use Summer Street if you must get past. We remember and honor those who have passed in service to our country. on Saturday, May 16th, from 9:00 a.m. to 2:00 p.m. There are still tables available to rent for $10.00 each ! Come and enjoy good friends and good conversation.